The big thing in computers between 2007 and 2010 was the rise of the Netbook: Small, low powered, low cost computers, running either Linux or Windows. The first Netbooks had a mere 7-inch screen at a stupidly low resolution of 1024×600. Then came 9-inch models, same poor resolution, but a more useful screen. Then came 10 and 11-inch variants. The price also started to rise as more powerful processors and components were installed. Then, just as quickly as they burst onto the scene, the Netbooks fizzled away. Until recently, the smallest you could go was 11-inches, which is a shame for those of us wanting to replace an older 9-inch device. Fortunately Toshiba have come to the rescue with this, the Satellite Click Mini. Moving to the right hand side of the tablet, there’s the power button and a volume rocker. Down on the keyboard, you’ll find a full size USB 2.0 socket and a full size SD card reader. The tablet half mounts into the keyboard dock on two metal latching pins, released by a button just under the screen on the dock. A dedicated connector joins the two parts. It’s at this point that you have to remember the Click Mini only costs £200, as there are elements that would otherwise be disappointing. There’s no USB 3 support, and the keyboard dock is compromised. Rather than put a small row of function keys in, Toshiba have put them on the A-H and Z-N keys. This means that other useful keys are relegated to hanging off the function key – doing Alt + Print Screen is now impossible. The trackpad is also small, although they have integrated the buttons into the tracking surface, so it could be worse. The biggest issue however is shown if you apply gentle pressure between the GHY buttons. Do this and you’ll see a noticeable deformation of the top surface of the keyboard dock. It’s not the end of the world, and it doesn’t affect typing, but it does make for a slightly clattery keyboard if you’re typing at speed. The weight of the Click Mini, both as a tablet and a laptop is acceptable. The hinge is nicely weighted and does gives a decent range of motion. Because the keyboard dock contains a battery, when touching the screen in Laptop mode, the whole device resists the urge to fall backwards. One criticism is that when the laptop is closed, there is a degree of flapping in the hinge. Connect the keyboard dock, and plug in the charging cable. Press the power button once and the screen will turn on, showing the battery status. Wait until the exclamation mark by the tablet disappears, and press the power button again to start the computer. The Click Mini comes pre-installed with Windows 8.1 with Bing. Windows boots quickly and is smooth and responsive under general use. Toshiba have restrained themselves here and supplied the Click Mini will minimal pre-installed software. Out of the box, you can comfortably use this computer. One thing you’ll be offered is the free upgrade to Windows 10 Home. The upgrade process is quick and simple, and nothing stops working as a result. If you’re tempted to do a clean install of Windows 10 after installation, you’ll need to have a USB keyboard and mouse to hand, along with a hub to connect them. Until Windows is installed with drivers, the touchscreen, keyboard, or trackpad are not recognised as input devices. Performing a clean installation of Windows is however recommended. This is because the Click Mini comes with a recovery partition, using valuable space on the small capacity flash module. After a bit of rationalisation, you’ll have a 28.5GB disk. After installing Windows 10 and office, you’ll be a bit under 14GB. The highlights are the screen, and the batteries. The IPS panel offers great viewing angles and decent brightness. The colours seem pretty good also. The method in which the batteries work is also clever. When used as a laptop, the system will first discharge the battery in the keyboard dock, running it down to empty. It will then start using the tablet battery. While charging, the process is reversed with the tablet charging before the keyboard. 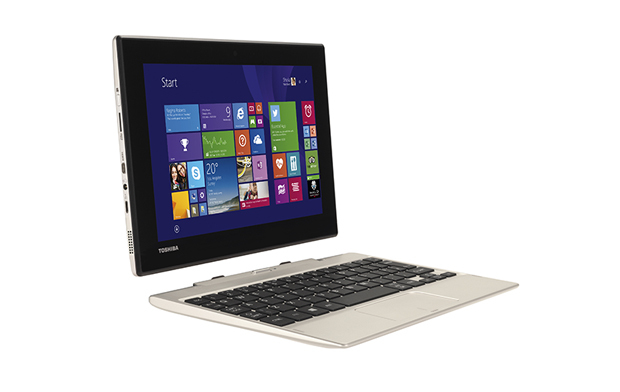 Toshiba claim a battery life of up to 13 hours for the Click Mini. This seems excessive, but numbers close to it could be achieved if you keep the brightness down, the connectivity disabled, and you don’t go taxing the processor too much. Key to getting the best out of any computer is looking after it. The first things it’s worth investing in are a laptop sleeve and a screen protector. A 64GB Micro SD card is a worthwhile addition. Depending on how you intend to use the computer, it is worth investing in a longer Micro USB cable. A USB OTG cable and a Micro HDMI to HDMI adapter are valuable. Finally, a HDMI to VGA and USB to 10/100 Ethernet adapters may come in useful. The screen’s headline resolution may be amazing, but during the normal use, the Click Mini cannot make full use of it. Windows has to scale to between 150% and 175% to make the screen useful. If run at native resolution, then items are too small to read or touch. While on the topic of touch, the screen is nicely responsive, although sadly, the same cannot be said for the touchpad, which can take a noticeable fraction of a second to begin responding after touching it. Full HD video playback is smooth and responsive, while the side-firing speakers offer enough volume for most use cases. There are both front and rear facing cameras, both are average in quality, and will do for Skype. If the Click Mini was priced at £300, it would be hard to justify buying one unless you desperately needed something this small. There are too many compromises to justify such a price tag, given the lack of USB 3, elements of poor quality, and a lack of accessories. At £200 on the other hand, the Click Mini represents exceptional value, even once the cost of some accessories are considered. The Click Mini is always going to be a niche device. It’s a good replacement to Android tablets when more functionality is needed. It will also be good for younger children, and where small size is the ultimate goal. The flip side is that it is really suited only to general office work, browsing the internet, and a bit of video.